Addicted to Rubber Stamping: Animal Fun! Hello my crafty friends. I am the hostess this week over at the Mod Squad Challenge. I am thrilled to be one of the hostesses for you. The challenge this week is to use ANY ANIMAL you choose in your project. To make it even easier, you can even use butterflies, bugs and birds. $25 gift certificate to use at White Rose Crafts LLC's store! I stamped the two horses in memento black tuxedo ink. I colored both images using Prisma Premium colored pencils and gamsol to smooth out the harsher lines. I then fussy cut (yes, you read that correctly) each of the horses and mounted them with tiny pieces of cut foam squares. The background is designer series paper and hello greeting die are from my stash. I mounted this on black cardstock with just a tiny border and then on a white card base. I didn’t think it needed any other embellishments. Our sponsor this week is White Rose Crafts LLC. White Rose Crafts LLC is a Virginia based online Craft Retail Shop owned and operated by Kay Barnes. Kay is a UK native who made her home here in the US eight years ago, and specializes in bringing beautiful, harder-to-find, high quality European products to her US customers at affordable prices, as well as stocking lots of the American based brands you know and love! We are a growing business, always striving to add new and unique products that will keep you coming back for more! During this week only, White Rose Crafts is giving you a 15% discount on your entire order! SHOP HERE. The code is: Modsquad Feb HH94XH. Shipping is flat rate priority (based on padded envelope rate) or free if you spend over $75. I hope you will come to Mod Squad Challenge and play along with us! Such a beautiful card, loving the horse stamps and you found the perfect paper for the background! Just beautiful! 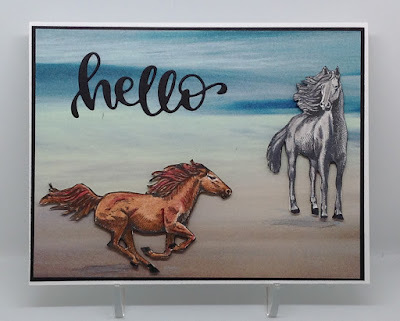 Beautiful card with that pretty scene you made and those wonderful horses. Great coloring too! I love that background paper you used for the scene. Welcome back to BLOGLAND Susan. Sure have missed you. So lovely to see you getting inky again and what beautifully coloured fussy cut horses. Perfect background too. Amazing depth of color on those horses. What a fun card!